While browsing a blog that I have linked to on my bloglovin’ page I came across a post on ‘My Big Fat Wedding’ giving ideas for fun alternatives to wedding cake. 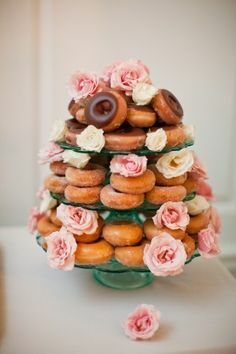 I’d never even imagined a krispy square wedding “cake”! It got me thinking about some of my favourite alternatives to the infamous wedding cake; after all the wedding should reflect your style as a couple and should include all the things you love, not just the things you think you should have. Not to mention the cost of a wedding cake can range anything from a cheap £150 to a scary £800. More personal and quirky alternatives can save you big bucks! Simply pop to a shop, select a range of different doughnuts and stack them on a stand or just tower them on top of each other. Either have individual mini pies or have a three or four different flavour full size pies – the pies could be served cold with cream or custard – doubling up as the wedding “cake” and the desert. Will you be going alternative? What sort of alternative wedding “cake” will you be having?